This is a work of fiction. All persons and events mentioned herein are entirely fictitious, and any resemblance to any real persons, living or dead, is purely coincidental. Special thanks to Kathy, to Alicia, and to Pat, whose many corrections and suggestions proved invaluable. Responsibility for all remaining errors is, of course, entirely mine. Time After Time ("We don't belong here? On the contrary, Herbert...") © 1979 by Warner Bros. and Orion Pictures Co.
Sherlock Holmes quote ("When you have eliminated the impossible") from The Sign of the Four. © 1881 Arthur Conan Doyle. Winston Churchill quote ("A riddle wrapped in a mystery inside an enigma") from a radio broadcast on October 1, 1939. So Why Is This Book Available Online For Free? Because I grew up using libraries, and have worked in them for well over twenty-five years. I happen to believe that you should be able to read a book before deciding whether or not to buy it. Unfortunately, with ebooks rapidly growing in popularity it's impossible to miss the dollar signs in the eyes of the publishing majors, as they at last see a perfectly legal way to freeze libraries out of the picture altogether. However, self-publishing enables me to retain all rights, including that of posting the complete book here as well. So you can consider this a blow for freedom, or an act of self-aggrandizement, or whatever else suits you. If you discover that you like this book and want a copy for your own library, it is of course possible for you to print it out from this online version. However, it'll come to at least 140 pages, put a lot of wear and tear on your printer, and leave you with a notebook full of ugly printouts. Instead, consider doing yourself a favor and downloading it for free as a nicely formatted ebook in .PDF format. In any case, I hope you enjoy reading the book as much as I enjoyed writing it. 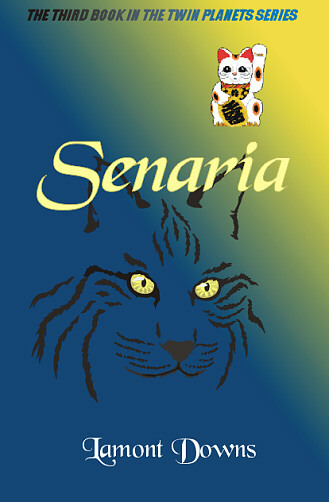 SENARIA. Copyright © 2000, 2003 Lamont Downs and his licensors. All rights reserved. No part of this work may be reproduced, stored in a retrieval system, or transmitted by any means, electronic, mechanical, photocopying, recording, or otherwise, without written permission from the author, except in the case of printing personal copies for non-profit personal use or brief quotations embodied in critical articles or reviews.